The nearest mainline station is Central. 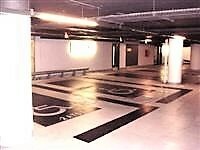 The dimensions of the Blue Badge parking bay(s) are 380cm x 610cm (12ft 6in x 20ft). The nearest Blue Badge bay is 15m (16yd 1ft) from the car park entrance. The furthest Blue Badge bay is 37m (40yd 1ft) from the car park entrance. 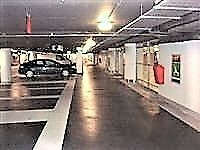 This information is for the entrance located in the car park beneath the centre on level B2. 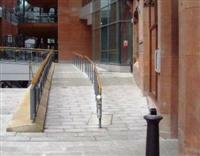 You are on Outside Access (Upper Ground - Ann Street). Skip to the next section. This information is for the entrance located on Ann Street. The width of the access point here is 190cm. 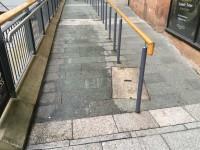 You are on Level Change (Upper Ground - Ann Street). Skip to the next section. 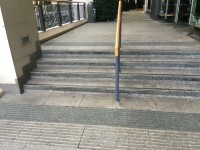 The handrail(s) is/are in the centre of the step(s). You are on Lift (Upper Ground Entrance - Ann Street). Skip to the next section. 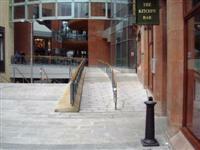 The lift is located by the upper ground entrance giving access down to the lower ground and toilets. 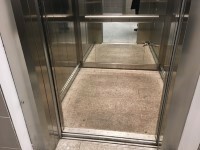 The floors which are accessible by this lift are UG, LG. 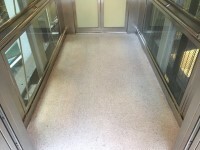 The lift is approximately 10m (10yd 2ft) from the upper ground entrance. 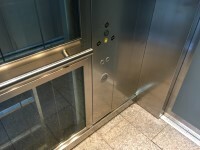 The dimensions of the lift are 140cm x 149cm (4ft 7in x 4ft 11in). 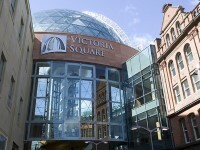 You are on Outside Access (Upper Ground - Victoria Street). Skip to the next section. 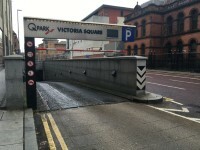 This information is for the entrance located on Victoria Street. The width of the access point here is 120cm. You are on Level Change (Upper Ground - Victoria Street). Skip to the next section. 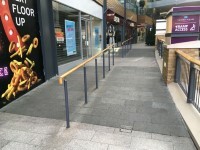 You are on Outside Access (Upper Ground - William Street South). Skip to the next section. This information is for the entrance located on William Street South. The width of the access point here is 195cm. You are on Level Change (Upper Ground - William Street South). Skip to the next section. 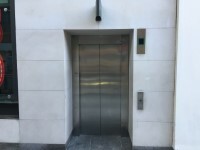 You are on Lift (Upper Ground - William Street South). Skip to the next section. 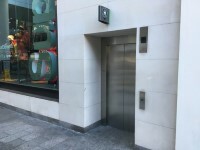 The lift is located next to the entrance at William Street South. 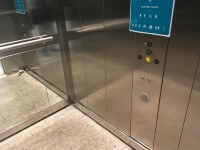 The dimensions of the lift are 140cm x 145cm (4ft 7in x 4ft 9in). Music is played in all public areas. 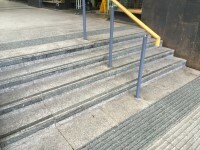 The floors which are accessible by stairs are B2, B1, G, 1, 2. 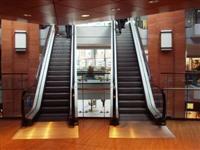 The floors which are accessible by escalator are B2, B1, G, 1, 2. 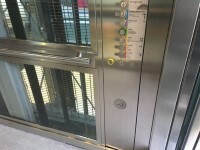 You are on Lift (Main Central). Skip to the next section. 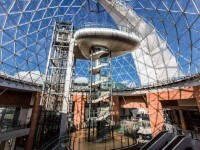 The lift is located in the middle of the centre. 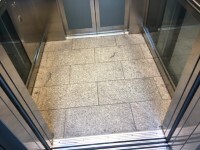 The floors which are accessible by this lift are B2, B1, G, 1, 2, 3. 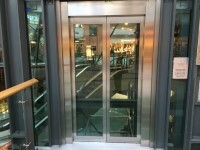 The dimensions of the lift are 140cm x 270cm (4ft 7in x 8ft 10in). There is usually a lift attendant present for the main lift. 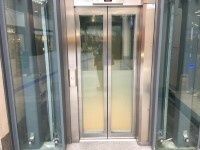 There are additional lifts at the Ann Street and William Street South entrances which give direct access to the lower ground floor. 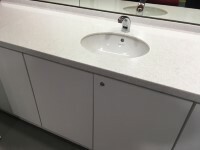 You are on Changing Places (B2). Skip to the next section. 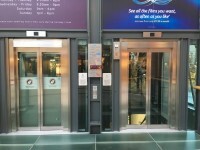 The facility is located on level B2, car park level 2 to the right as you exit the lift. The facility is approximately 10m (10yd 2ft) from the main central lift. 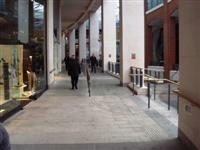 The key can be obtained from customer services on the lower ground floor. The door is push pad activated. 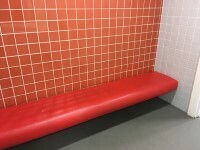 The dimensions of the facility are 300cm x 492cm (9ft 10in x 16ft 2in). 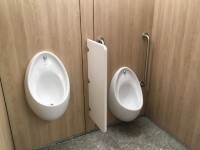 The transfer space on the left as you face the toilet is 190cm (6ft 3in). 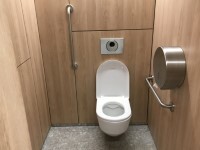 Drop down rails are provided for the toilet. 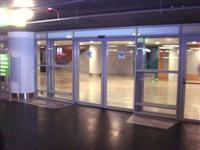 The automatic door is RADAR key activated externally and push button internally. 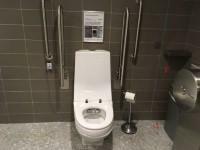 The WC is a Geberit AquaClean self washing and drying unit. 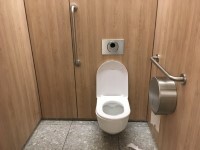 You are on Accessible Toilet (B2). Skip to the next section. 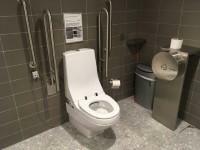 This accessible toilet is approximately 3m (3yd 10in) from the main central lift. 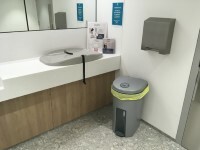 This accessible toilet is located on level B2, car park level 2, to the right as you exit the lift. 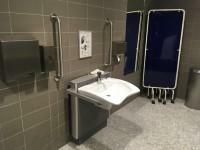 The dimensions of the accessible toilet are 150cm x 212cm (4ft 11in x 6ft 11in). 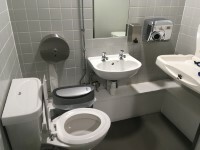 There is a second slightly larger accessible toilet next to this toilet with right hand transfer space. 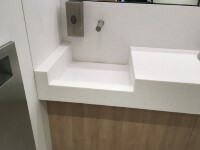 There is not an unobstructed 150 x 150cm turning area in this toilet. You are on Standard Toilet(s) (B2). Skip to the next section. 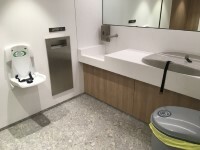 The female toilet facilities that were surveyed are located on level B2, car park level 2, to the left as you exit the lift. 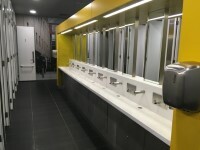 The female toilet(s) is/are approximately 20m (21yd 2ft) from the main central lift. 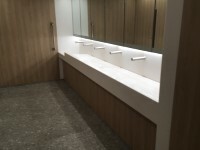 The male toilet facilities that were surveyed are located on level B2, car park level 2, to the left as you exit the lift. 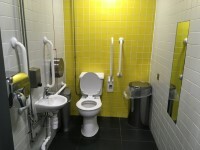 The male toilet(s) is/are approximately 10m (10yd 2ft) from the main central lift. You are on Parent and Baby Room (B2). Skip to the next section. 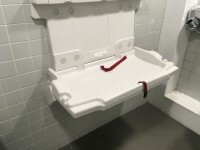 There is a parent and baby room for public use. The parent and baby room is located on level B2, car park level 2. 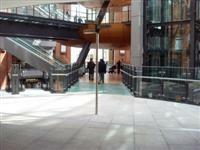 The parent and baby room is approximately 10m from the main central lift. There is step-free access to the parent and baby room. Staff do need to be notified for use of the room. There is tactile and pictorial signage on or near the parent and baby room door. 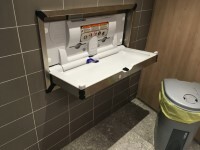 There are disposal facilities in the parent and baby room. 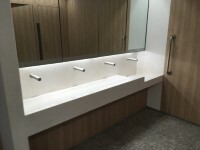 There is a wash basin in the parent and baby room. 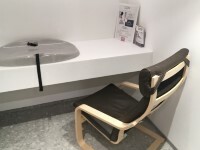 There is a/are chair(s) in the parent and baby room. 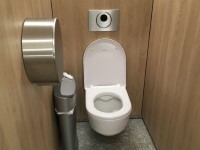 There is a toilet in the parent and baby room. 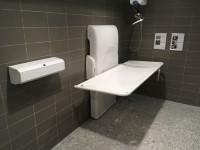 The chairs are located in separate nursing rooms. 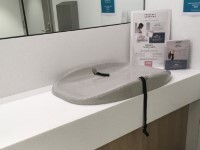 There are 2 parent and baby rooms and 2 separate nursing rooms, all with RADAR key access, available from customer services on the lower ground floor. 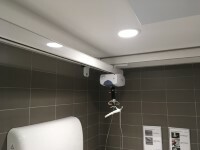 You are on Accessible Toilet (LG). Skip to the next section. 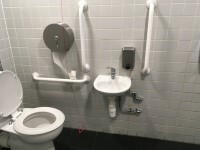 This accessible toilet is approximately 3m (3yd 10in) from the Ann Street lift. 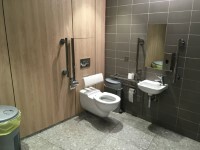 This accessible toilet is located on the lower ground floor to the right as you exit the lift. 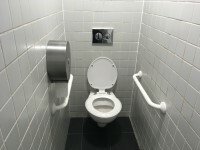 The dimensions of the accessible toilet are 247cm x 260cm (8ft 1in x 8ft 6in). The lateral transfer space is 187cm (6ft 2in). 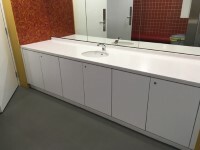 There is a second smaller accessible toilet cubicle opposite without baby change facilities as shown in photograph 4. You are on Standard Toilet(s) (LG). Skip to the next section. 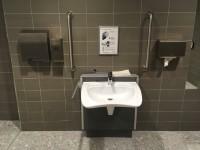 The female and male toilet facilities that were surveyed are located on the lower ground floor by the Ann Street entrance. 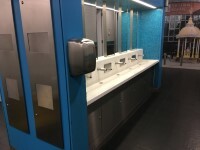 The female and male toilets are approximately 10m (10yd 2ft) from the Ann Street lift. 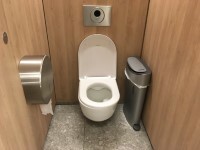 You are on Accessible Toilet (Level 2). Skip to the next section. 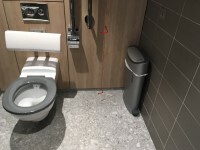 This accessible toilet is approximately 130m (142yd 6in) from the lift. 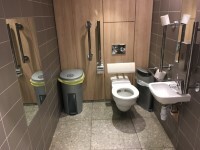 This accessible toilet is located on level 2, next to Nando's. 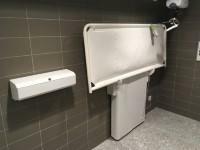 The dimensions of the accessible toilet are 174cm x 218cm (5ft 9in x 7ft 2in). 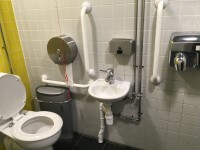 There are 2 accessible toilet facilities: one is left hand transfer, the other is right hand transfer. 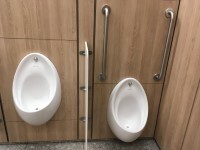 You are on Accessible Toilet (Level 2 - Male). Skip to the next section. 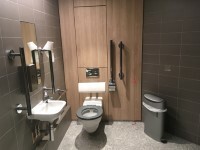 This accessible toilet is located on level 2 in the male standard toilet facilities. 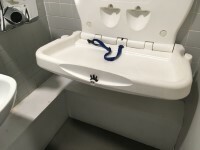 This is a male facility. 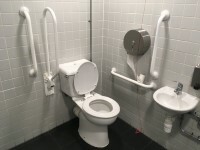 The dimensions of the accessible toilet are 157cm x 219cm (5ft 2in x 7ft 2in). You are on Standard Toilet(s) (Level 2). Skip to the next section. 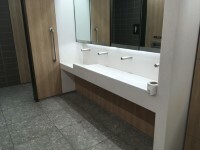 The female and male toilet facilities that were surveyed are located on level 2. 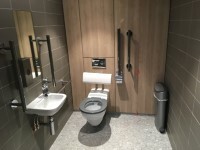 The female and male toilets are approximately 120m (131yd 8in) from the lift. You are on Parent and Baby Room (Level 2). Skip to the next section. 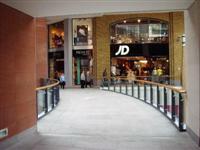 The parent and baby room is located on level 2 next to Nando's. 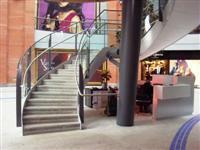 The parent and baby room is approximately 120m from the lift. Staff do not need to be notified for use of the room. There is tactile, pictorial and written text signage on or near the parent and baby room door. 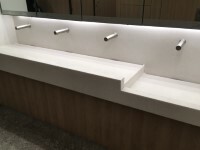 The wash basin tap type is push. 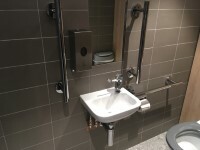 There are 2 toilet cubicles with baby change facilities and a separate bench and wash hand basin with sensor mixer tap.